According to the LiDAR mapping carried out by the Indonesian Peat Restoration Agency (BRG), one of the pulpwood concessions belonging to PT RAPP, a subsidiary of pulp and paper giant APRIL, located on Pulau Padang in Sumatra’s Riau province, is largely composed of deep-lying peat. 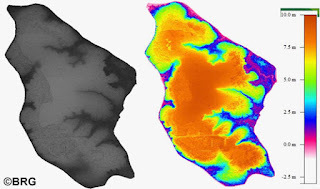 LiDAR is a surveying method that measures peat deafness using pulsed laser light. The results of the LiDAR mapping performed by the peat agency were also backed by the Indonesian Geospatial Information Agency (BIG), the Ministry of the Environment and Forestry, the Indonesian National Institute of Aeronautics and Space (LAPAN), the Ministry of Agriculture, the Ministry of Public Works and Public Housing and Gajah Mada University. In February this year, Environment and Forestry Minister Dr Siti Nurbaya signed the peatland ecosystem map, which classifies various peatland areas into protection and utilization zones. This map also indicates that the bulk of the APRIL concession on this small Sumatran island lies in a protection zone. The ministry has imposed a tight schedule on almost one hundred pulpwood companies to revise their 10-year work plans by incorporating peatlands classified as protection zones into these revised work plans. Pulpwood companies under the control of the APRIL group are no exception in this regard. Last year, PT RAPP was declared by Indonesian authorities to be involved in a series of peat violations after a ban on any new peat development was issued by the Indonesian government in early November 2015. This first of these peat violations was uncovered by a surprise inspection of the APRIL concession by the Peat Agency Chief Nazir Foead who witnessed first-hand the new peat development practices being perpetrated by the APRIL company in its Pulau Padang concession. On the basis of these peat violations, the ministry suspended the operations of the APRIL company in this concession. Not long thereafter, in September 2016, the ministry uncovered the legal fact that the APRIL company was still adding new plantation areas involving peatlands through its new peat development practices. This finding prompted PT RAPP’s 10-year work plan to be revoked by the ministry in early October 2016. This was not the end of the matter – the ministry also discovered on-the-spot facts demonstrating that the APRIL company was committing peat violationsin the form of new peat development in another of its concessions situated in the Kampar Peninsula landscape, also in Sumatra’s Riau province. In early December 2016, the ministry ordered the company to remove the acacia recently planted in these newly-developed peat areas. However, the APRIL company failed to comply with this instruction. This lack of compliance resulted in the imposition of sanctions on PT RAPP in early March this year, compelling the Singapore-based company to get rid of the acacia planted in these newly-developed peatlands as well as to close the new canals constructed there. Eventually, the APRIL company reported, via an official letter sent to the ministry (Mar 31), that it had partially removed the acacia planted in the newly-developed peat areas and closed some of the new canals it had developed. The company also asked for an additional 30 days for it to comply with the provisions of the sanctions in full. It should also be noted that the APRIL company’s operations were also hit by sanctions from the ministry due to the peat fires which ravaged its Pulau Padang concession in 2016.